UNM Parking & Transportation Services (PATS) has announced an upcoming shuttle service adjustment and continued parking enforcement for fall break, Oct. 11 – 12. PATS will operate a combined shuttle service route to Yale Mall, Research/SSSC, Lobo Village, and South Lot from 6:30 a.m. to 7 p.m. on Oct. 11 and 12. Service to these stops will operate on a continuous loop, not on a timed schedule. 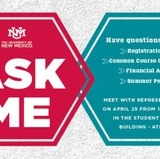 Visit wmb.unm.edu or download the LoboMobile app to track any UNM shuttle real-time. Regular shuttle services will resume at 6:30 a.m. on Monday, Oct. 15. UNM Parking regulations will be fully enforced during fall break. The Yale and Cornell parking structures and surface lot pay station parking spaces are subject to enforcement 24/7. Regulations pertaining to fire, safety, reserve and ADA accessible parking spaces are enforced 24/7, 365 days of the year. Student resident R and S zones are enforced Monday – Saturday during the fall and spring semesters. PATS business and transportation office will be open from 7:30 a.m. to 5 p.m. during fall break.